If you were planning to take a selfie while casting your precious vote, don’t think about it as you will not be allowed to use mobile phones inside the poll booths. 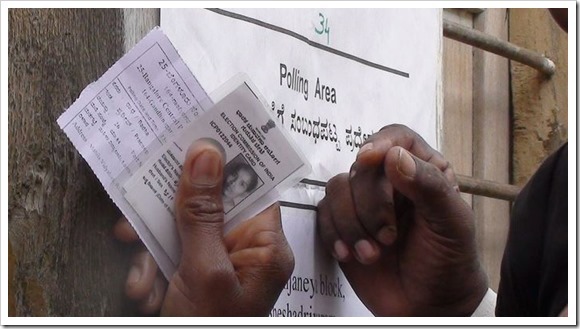 The Election Commission of India has banned use of mobile phones inside the polling booth stations during these General Lok Sabha elections except for the presiding officer and the first polling officer. Even, both these officers can only use their mobile phones to send reports that too through SMSes! This directive has been included in the handbook released for presiding officers for the general elections. Also, according to Supreme Court’s suggestion, all polling booth will be monitored 24X7 through CCTV cameras, and videography of poll proceedings may be carried inside the polling stations by authorized election personnel only. According to the guidelines, any form of photography or videography shall not be allowed by media persons or any other other unauthorized persons inside the polling station, to maintain general order and secrecy of vote. However, taking videos or photographs outside the polling station of crowds lining up outside to vote has been allowed. Among other things, the directive also states that no personnel will be allowed inside the polling station at anytime, who are not either a voter or the EC’s presiding officer (and their assistants). The directive states. “Neither the CEO nor the Returning Officer is empowered to authorize any person who is not an elector or who is not required to assist you in taking the poll, to enter a polling station. Any such person, including publicity officials of the State Government, should not be allowed inside a polling booth without a letter of authority from the Commission”. It is quite clear that Election Commission has taken number of steps this time around to ensure law & order is maintained inside polling booths and privacy of voter is completely taken care of.